CAAMfest 2016 finished up last Sunday, but not before hosting the legendary Hong Kong director Mabel Cheung, screening her newest film A Tale of Three Cities, as well as her classic 1999 epic historical The Soong Sisters. I was lucky enough to sit down to talk with Mabel and her husband and filmmaking partner Alex Law (who directed Echoes of the Rainbow, among other excellent Hong Kong new wave films). Although Cheung and Law worked with mainland China film production entities back in the nineties when they made The Soong Sisters, in the decade and a half since then the Chinese-language film market has completely changed. I talked to them a bit about their experiences creating A Tale of Three Cities as a Hong Kong-China co-production, their thoughts on the constant migration of the Chinese people, and the intricacies of dealing with the Chinese censorship board, among other topics. BEYOND ASIAPHILIA: So I know you’re here for your new movie. Maybe you should talk a little bit about how you found the story and why were you interested in it? MABEL CHEUNG: Well, It started as a documentary more than ten years ago. That’s the time when Jackie Chan suspected that he’s not his father’s son. And so he asked his father, and his father said “Well, I’m growing old so maybe I’ll tell you the story before I die. Otherwise it will be buried,” and so Jackie Chan had to go back to Australia, because his father works in the American Embassy there. So he asked us, “Would you be interested in coming along? To listen to the story? I’ll pay for everything,” he said (laughs). So he said, “Just make a family video. It’s not supposed to be a documentary.” So we went because it was the Chinese New Year holiday and it will be nice to spend the holiday with Jackie Chan. So we went and listened to the story. But we didn’t expect that it was going to come out to be so dramatic. Alex Law: Because at that time everybody in Hong Kong thought that Jackie Chan’s father was a chef because he’s pretty well known for his cooking. He likes to cook for his friends and (Jackie Chan’s) mother was like a household maid working for the American Embassy in Hong Kong. But suddenly it turned out his father was a spy and his mother was an opium smuggler (laughs)! It was so surprising! BA: So the people who raised him were not his parents, or did they just have two different lives? BA: I know that the film is set in China. Is it also in Hong Kong? A lot of your past movies were about people who are separated from their homeland who have to travel elsewhere. Is this also similar to that? Does this film also have an immigrant story? MC/AL: Yeah, actually it’s an immigrant story except that it happens during wartime. They escape from Anhui to Shanghai and then to Hong Kong after 1949 when the communists took over. So it’s also a story of immigration. But then this always happens in Hong Kong. You know, Hong Kong is a place for all the immigrants. And then we immigrated elsewhere for different reasons. MC: This happens all over and over, in Chinese history. In San Francisco they have a lot of illegal immigrants in the 19th century for railroad builders and gold-diggers, and then during the Qing dynasty in 1911 during Sun Yat-Sen’s time everybody escaped from China, then in 1949 the exodus, and then the Cultural Revolution, another exodus, and then in Hong Kong before 1997 everybody tried to immigrate as well. AL: It’s a little like a merry-go-round, actually. People like to escape and then come back. MC: And then they also emigrate to Shanghai and Beijing and the other way around. MC: And now they are starting to emigrate to Taiwan. AL: Yes. Little things like that scare people. BA: Are these mostly people of who are wealthy or middle class? Or do the working class escape also? MC: No working class. In the past, of course, it is the working class during the Qing dynasty but now I think it’s people with money. MC: They think of the future. BA: Because they can’t afford to leave without money. So then the working classes are stuck. MC: We made this film for my parent’s generation because they all escaped–like Jackie Chan’s parents, they escaped from China to Hong Kong in the 1950s. And then we were born in Hong Kong. Their generation of people built modern Hong Kong. They have to start to build a home from zero and with no money, and they left everything behind in China. I think that people who could escape to Hong Kong at that time must be the best and the strongest. BA: Is that the general consensus that the strongest came? MC: I think so. If you look at Jackie Chan’s father, he’s very strong and very charismatic and you know that he can fight and shoot people, he can kill, and you know he’s a survivor. BA: What about the ones who go to the US? MC: Can they survive the poverty? The people who can survive and have families must be the strongest. AL: A friend of mine told me that every time there’s a war— take for example, the second world war–he said that people who finally survive the concentration camps live the longest. They had long, long lives because they were so tough–they are the toughest people. BA: What about the people who stayed in China? MC: I think they survive all the different revolutions or whatever, the movements, so they are very I strong. Look at China now, there are very strong people. BA: That’s pretty interesting if you think of all of this different migration going on through history. MC: And now Europe. The same thing goes on, which is a more less the same at the ending of my film. People escape as they smuggle themselves on a fishing boat, and a lot of people are crammed at the bottom and a lot of people die even before they reached their destination. BA: So why do you think you’re attracted to these kind stories? MC: Because I want to make a film about my parent’s generation. I think I owe that generation a story. I didn’t have time to, for my mother. I didn’t listen to her story and then she died ten, eleven years ago. And at that time we already knew Jackie Chan’s father because we had made that documentary with him. And then we become friends afterwards. We drink and have dinner and we have a good time, and so he told us more stories about his lifetime. MC: Jackie Chan’s mother passed away right after we finished the documentary. BA: So was she able to see it? AL: No, she was suffering from very serious Alzheimer’s and she could not quite know who’s who. BA: So this is the first co-production you’ve worked on with China? MC: Not really. The Soong Sisters is also a co-production. It was at the beginning of co-production, before 1997. MC: And they didn’t have the money. MC: But now it’s definitely changed around. AL: Yeah, now it’s the other way around. BA: How has that affected the filmmaking process? MC: Well, the censorship system is more or less a thing, except that now the Chinese production company controls everything so you have to report to them. Before, we had to report to the Hong Kong film company. BA: Is there difference between what they expect? MC: Actually, our film companies are very good and so we initiate the stories. They read the script and they liked it, so they didn’t interfere too much. And so we have the same creative freedom as we had before with The Soong Sisters. Even with casting and everything. We have the casting before and we submitted the scripts to the production company so they knew exactly what would happen. The cast, and the crew, everything we have already put together. BA: So you put a package together? But then what when it goes to the Chinese censors? MC: This is even better than The Soong Sisters. Back then the censors cut eighteen minutes from The Soong Sisters but this one they didn’t even cut anything. Just one or two places where I think the writing was wrong on the posters. Otherwise they didn’t touch the film. BA: So then it was pretty smooth for you. AL: It was much better than we thought or we feared. BA: Had you heard that there would be problems? Or issues with co-production? MC: Because of The Soong Sisters experience we were quite worried about the censorship. BA: Because they cut so much before? But now you send the script out before you start shooting, right? To the SAPPRFT (State Administration of Press, Publication, Radio, Film and Television)? MC: That was okay too. Because now I think it’s not so centralized. They allow the local government to decide. And the local government is usually friends with the film company. So sometimes for local productions they don’t even read the script. For local filmmakers, I think. Not for us–they have to read our script. BA: Because you’re from Hong Kong? BA: Because I know that one of the things that I think some people worry about is that Hong Kong directors have to change scripts or the things that writings about because they’re working with Chinese censors. MC: It’s not the censors but the production company. If you’re not a strong creative person and you are a director for hire, the production company will give you a script and you do it according to their wishes. But then there are also directors who submit their script to the production company and then they have creative freedom, if the production company accepts the scripts as they are. BA: Are there projects that you that you wanted to work on but you’re not able to do in China yet? AL: First of all, we more or less know what projects will pass or what will not pass. BA: So you know ahead of time. You don’t submit into something that is not going to get approved. BA: That’s pretty curious to us in the US about the ghost stories. Why is that? MC: They think maybe it will lead people to superstitions. AL: It’s very funny. They will say, okay you cannot have a ghost in your movie but you can have a yao. Yao, meaning like a genie–let’s say an animal that turns into a genie. If you talk about a wolf that turns into human being, that is a yao, or a snake that turns into a very seductive woman, that is a yao. So you can have yao but you cannot have a ghost. MC: I don’t really understand why, though. Yao can also turn people to superstitions. AL: Yeah, for me yao is almost like a ghost because it does supernatural things. MC: Maybe they think that a person cannot turn into a ghost. BA: So it can be an animal turning into a person but not a person turning into a ghost. MC: Because an animal turning into something is incredible. But the person turning into a ghost, people may believe it, maybe. I don’t know (laughs), I don’t know. BA: Maybe you just don’t do it. BA: Anything else? No politics right? BA: No religion? Nothing religious at all? Like even Buddhism? MC: I don’t know. I mean it’s different from time to time. BA: But you have to be punished right? (laughs) Oh! No gangsters! MC: At the end, the police cannot be a bad person. BA: The police have to die if they’re bad? AL: If he is a bad cop, he has to die! BA: In Malaysia–so it’s same thing in China now? MC: I think so. You remember the film Infernal Affairs. BA: That’s right, they made a China version. MC: A China version where Andy Lau died in the end! MC: Yeah, if it is a dream then you can even have a ghost. MC: Do you think the audience knows that there are restrictions? MC: Oh, they know. They think it’s really a laugh! BA: What was the last time you made a film in Hong Kong? Was it Echoes Of The Rainbow? 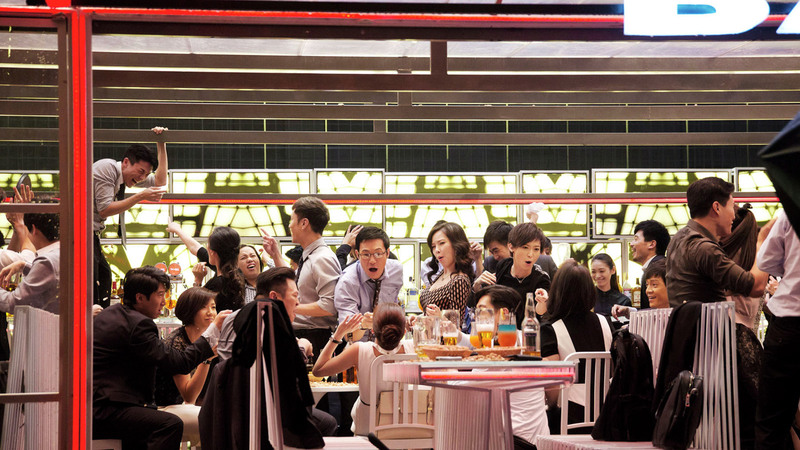 Do you still want to make films in Hong Kong that are only financed in Hong Kong? MC: We never consciously say that we want to make films only in Hong Kong or in China or wherever because if you look at the films we produced, wherever it is suitable to make a film or wherever we have interesting topics or a good cast, we’ll make a film. At the beginning of our careers we made a film in New York, An Autumn’s Tale. BA: I love that movie. MC: And then we made a film in China, Eight Taels of Gold, which was before everybody did. Because that person went back to China, so we shot in China. So it’s a necessity of the location. I think as filmmakers we shouldn’t restrict ourselves to making films only in Hong Kong or China. I think we should widen our horizons and make films wherever there’s an interesting topic. BA: Have you seen the film Ten Years? MC: Not yet, but it is a big controversy in China. AL: I think it was getting more and more popular in Hong Kong and then suddenly the cinema chain cut it because it was too popular. MC: They got pressured from China. BA: How does that affect the filmmaking community when you find out something like that? MC: I think the film director’s guild gave it a special jury award. BA: I think it’s nominated for Best Picture also? BA: That’s a very local film, right? Do you think that there is still an audience for very local films like that in Hong Kong? MC: The box office is very good! I haven’t watched the film yet but it’s about ten years from now and the things that will happen to Hong Kong. The young people especially were very interested, and that reflects their fear and their concern about the future of Hong Kong. BA: Do you think more films like that will be made and shown? MC: For as long as they can make money then (laughs). AL: There are still more other organizations, some people, who are you know worried about the future of Hong Kong, and then every now and then you would see these producers with the visions who will say okay you do it. Ten Years I think was produced by a religious organization in Hong Kong. MC: They paid for it, but it was very cheap to make. AL: It was done by five new directors on a shoestring budget. BA: But then how did it get distributed? How do people find out? MC: It was only shown in one cinema that’s for special films, independent films like that. So people heard about it and more and more people. Only it is shown in one cinema but I heard it’s full the a whole day, and so people heard about it and so more people lined up for the tickets and so it got bigger and bigger. BA: And it spread to other theaters? BA: And then it stopped. MC: Right, and then it stopped. BA: So that reflects a lot going on politically in Hong Kong as well, like the localization movement. How is that affecting people making movies in Hong Kong? Is it separate, the idea about politics and filmmaking? This one seems to b very close to that, but how about commercial filmmaking in Hong Kong? MC: But in Hong Kong we don’t have the censorship problem so we can make any film. I think people will make any films they like while they can. You don’t know when the censorship system will come. BA: Do you know if that’s making people make more of these kinds of movies right now because they can? AL: People get more cautious? MC: I don’t know about the commercial film companies—they would not dare to invest anymore in films like that but then of course there are independent filmmakers that who can make films like that in a very low budgets, or with volunteers. 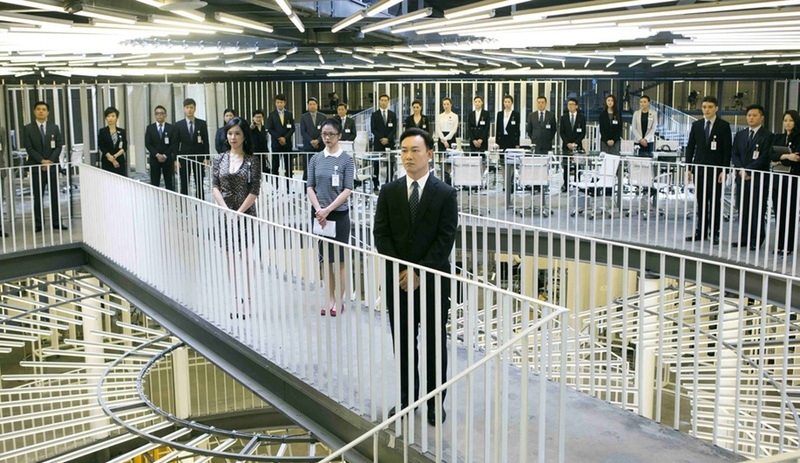 BA: Does it seem like independent films get an audience in Hong Kong? MC: Cut off because of the cinema owners, I think. AL: Not because of the box office but because the owners or the distributors got worried. MC: Because they also have business in China. So I think China can control people by the economy, with the business. BA: So it doesn’t have to be threatening? MC: No. They don’t even have to say anything. (laughs) That’s what they do with the rest of the world, too. Everybody who wants to do business with China has to kowtow, right? Even the queen has to get an invite (laughs). BA: China is very powerful now, business-wise, but it’s unstable in a lot of ways. MC: The economy is going down again. AL: It never been stable, actually. In the past 100 years, China has never been stable. Although financially they are getting bigger and bigger. And even the film market is now number two in the world next to America. They say that in two to three years it will surpass the USA. BA: Is that for mostly Chinese language-films that are locally produced in China? MC: Yeah, I think the best-selling films. The Chinese films have surpassed the Hollywood films. MC: But then of course the Chinese government controls the release of Western films. They will not get the “golden time” (note: these are the times during the year such as the Spring Holiday when Western films are prohibited from screening in China). AL: Sometimes when it (a Hollywood film) gets too big and too popular, they say stop, and then suddenly it disappears also! BA: So how does that affect you all as filmmakers? AL: It gets more difficult to get a producer to finance your film. Because they are worried and they only invest in films that they believe will make money. MC: Yeah, the comedies and action films, they are safe. BA: If you want to make something like this last film, for instance, that is less like an action film it’s harder to find financing? MC: It’s always difficult to find investors for our films. For A Tale of Three Cities we spent about ten years trying to find an investor because it’s not a kind of mainstream thing and they don’t want to risk, you know. There was one film company that expressed interest, and then we went into production. That was five years ago and we have the casting ready and everything. But then they calculated the budget and said it’s too high. Because it’s a film where people escape from one place to another we wanted to shoot in the actual locations–so from Anhui to Shanghai to Hong Kong and the big exodus and the illegal immigration and all the people and it’s is really expensive. They backed out because they think the budget is too high and they do not want to risk. Then we waited for another two years for Nansun Shi, who is a very good producer. She found us the money and so we started again. AL: 70 million–in American dollars that’s how much–a hundred? No, hmmm. MC: It’s in renmenbi—70 million. BA: So then Echoes was how much approximately? BA: But Echoes was very popular. It made back its money? BA: And won awards? But not anything like the Chow Sing-Chi movie. BA: And that’s what they want right? MC: With the investors, money is the first thing, you know. If they are not sure they will not invest. There are so many people who want to make movies. BA: They all have these movie theaters now they have to fill, right? MC: Oh, there are lots of films being made in the China. And maybe no more than half make it to cinemas. AL: And maybe even less than that. The majority of Chinese movies don’t get shown theatrically and there’s so many films that you’ve never heard of. BA: What did they do with them? MC: They put them on the internet. Now the internet pays quite good money. BA: But you want to make movies to be shown in theaters? MC: Sometimes now people open the movies at the same time on the internet and also in the cinema. BA: So then, do you think of yourself as a Hong Kong filmmaker? Or a Chinese filmmaker? Or just a filmmaker? BA: But maybe twenty years ago you would say Hong Kong filmmaker? MC: Or basically a Hong Kong filmmaker who wants to be a filmmaker everywhere (laughs). BA: What do you think you’d like to do next? Do you have a project you’re working on? Or many projects probably? MC: Yeah, we have ten scripts written already but we’re trying to get investors. MC: Actually every one of our film has problems with investors (laughs). So we’re used to it.